From purchasing software, to spending on maintenance and support, Software Asset Management has the potential of taking up a large percentage of your organization’s IT budget. Managing IT spend wisely is a top priority for both finance and IT professionals, and so License Dashboard has developed a range of SAM solutions designed to help monitor, manage and optimize the licensing and procurement of your software assets. With a reported 68% chance of receiving a software vendor audit, from at least one vendor, within the next year, the chances of receiving a notification are at an all time high. License Dashboard’s suite of Software Asset Management solutions offers you full visibility of the applications deployed across all platforms and reduce the disruption brought about by vendor audits. Being fully prepared should a software vendor send notification of an audit is only part of SAM. Ensuring the licenses already purchased are being utilized to their full reduces the change of overspend. Are you in a fit state to be audited? Are you wasting your software budget? Are you bogged down by transactional tasks? Understanding which software assets, hardware assets and licenses are being used by your organization at any one time is the first step to saving money and minimizing risk. It’s essential in effective SAM and essential in making strategic procurement decisions. License Dashboard’s visibility of estate solution will locate and identify IT assets, and produce actionable inventory data. Your organization’s software asset management data can come from multiple sources, which means it will likely include inconsistencies in format. Effective SAM ensures software is available to users with a legitimate need, while at the same time preventing unnecessary spend and safeguarding against falling foul of software licensing conditions. With the increased possibility of at least one software vendor audit each year, the business case for software licensing compliance is clear, but that’s only part of the story; the average organization also over-spends on software by as much as 20 per cent. 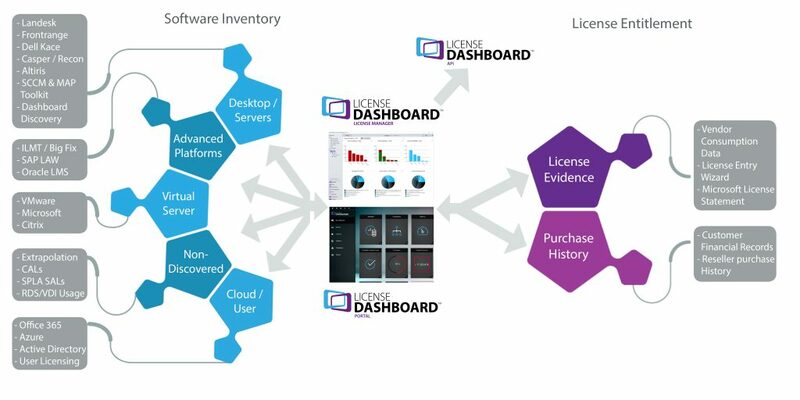 License Manager and Dashboard Discovery solutions work together to allow organizations to achieve and maintain software license compliance and save. Only when you understand what software is being used can your organization create an Effective Licensing Position (ELP), and so a critical requirement of both software asset management and License Management is an accurate audit.